Seaside Bees is a response to worldwide problems with bees, diseases, chemicals and our food production. It is nice to be doing something positive in a world gone mad. When we got our own bees, we really enjoyed the whole process. If you have time to get your own bees and build your own hives we thoroughly recommend it. Meanwhile we are expanding and sharing some of our bees by renting out hives for people who are keen but don't have the time to get into this themselves. We are based in Papamoa, (New Zealand) renting urban hives, that are fully managed hives where you all the surplus honeycomb beyond what we want to leave for the bees over winter. We focus on making beekeeping as natural as possible, the bees make their own wax comb. As well as your own honey you can use the wax for your own candles, cosmetics such as lip balm which can make nice gifts. Seaside bees can be broken down into three areas bees, hives and support. Bees can be rented, bought or caught. Caught is nice because it is free, but you have to do your homework and have all the gear ready and waiting. Rented is easy because the hive is fully managed, legally registered, inspected and all taken care of. Bought is in the middle in terms of effort and cost, it is all set up for you, but then you become a beekeeper. All three are good depending on your circumstances. Consider that honey is said to help hayfever sufferers and asthmatics if the honey is made from local pollens. No good buying honey from miles away to get the same properties. It is always going to be cheaper to buy from the supermarket, but you probably can't buy your local honey there made in a 5k radius. Having a hive in your garden is much much more than getting some honey, bees are cool and give all manner of benefits to your garden and all your neighbours. There are various styles of beehives, frankly the bees don't care as much as beekeepers and the hives impact the beekeeper more than the bees. 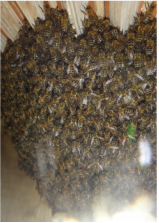 From an enjoyment standpoint, it is fantastic to have an observation window and it is very popular to be able to show people the inside of the hive. A lot of people make their own hives and you are most welcome to take a few of these ideas. If you want help with a kitset or want to buy a whole hive, just get in touch. If you have some good ideas and something leap frogs past our ideas, please don't hesitate to share. I'll put more details down if you are interested. For a start though read and digest the free plans provided by Phil Chandler, Barefoot Beekeeper, easily found on multiple websites. 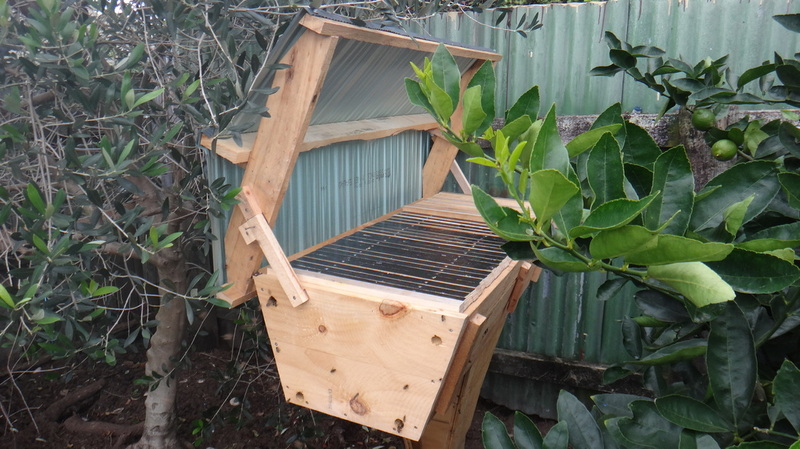 We have modified typical plans of top bar hive (TBH) for NZ conditions. Basically, making the hives bigger and Langstroth compatible. A convenient size of wood is available in the form of 12x1" rough sawn pine planks from the likes of Bunnings. We use three pieces of this for sides and bottom of hive without much/any trimming. A piece is cut for each end. You need to purchase about 6m of this per hive. We then use rough sawn 4x1" for the top bars. We put an inspection window along one side. It is a lot easier if you have a table saw and mitre saw. We use entrances at the end board and our favourite form of legs is to put in a single No. 2 round 115mm pine fence post, 1.2m long; 600mm into the ground and 600mm above ground. The hive goes on top and is secured with a brace at 45 degrees. From a theft and installation point of view it is relatively secure, hard to steal and very cheap and easy to put in. If you do need to move the hive, you need to gain access to the coach bolt in the hive and if you are suited up it is actually pretty easy. But we try to avoid moving hives, we like to consider them semi-permanent. The top bars are all 483mm / 19" long. This makes them the same length as Langstroth frames, but a very unattractive proposition to commercial beekeeper hive thieves trying to populate Langstroth hives. Top Bar Hives Versus Langstroth, Why? We manage both of these hive styles, they each have advantages. For the urban garden we prefer Top Bars, we'll discuss those reasons. When we check the hive, we are not opening the whole thing up, so it is less invasive just one comb at a time. They will attach new comb to the sides, but we use a long bread knife and skim 1cm off the side of the hive, this is rarely necessary to repeat once the gap is established. They overwinter beautifully for us. The bees like doing natural comb, it doesn't require any foundation, they manage their own amounts of drone brood and no queen excluder is needed. As for harvest, beautiful cut comb is possible or add a chunk into your jars of honey. There is also a nice beeswax harvest. In our hives brood is normally in the first 1/3 the other two third is honey and it is just a matter to harvest a 2-3kg comb as they fill them and reinsert the empty trying to cycle out oldest wax. Good for permanent apiaries where you don't often move the hive and so you can work at a nice height while doing it. More fun and less work because you don't need to lift heavy boxes, don't need to work at different heights and don't need to worry about squashing bees between boxes. Others have written there is 20% less honey and 100% more wax harvest, if so, we're comfortable with that. If you have obtained bees / hive / gear then you might be all set with some good books and You Tube; take it easy, go slow. But still it is great if you have people you can call when you need. From where on your property to site your hive, to having wasps come and kill some of the bees and steal their honey, there are decisions to make. Most of it is not rocket science and if you can find a local mentor who will help you all the better. We have to charge for our time in order to put food on the table like everyone else, but we are keen enthusiastic and available. The important thing is that we are local and we do house calls. Support can be about buying the right gear and making informed decisions. If you buy a hive we are not going to tell you how you have to manage it. But we will be happy to explain various pro's and con's and to tell you how we would manage it. The more you read on the subject of bees, the more you may find it is endless and that it is management as a whole; rather than certain individual steps which are considered taboo by opposing view points. Our preferred stance is a natural one with least exploitation and minimum stress for the bees as compared to the large operators providing for supermarkets and such like. For example we don't steal all the honey, we don't feed our bees sugar if we can avoid it, we try to leave them plenty of their own honey for winter so we only harvest any surplus they really don't need. The end goal is sitting on your deck watching 'Bee TV' its awesome, honey and wax are a bonus and awesome too.